Our fundraising campaign is still under construction. We are accepting contributions during pre-launch. We await announcement of dates for the trial. heart and mind, there will be peace and harmony. There can be no justice without rule of law. has filed suit against the Constitutional Court of South Africa. This is the case of “The People” of South Africa, represented by UZA v. our public servants who made a solemn oath to serve and protect the people; instead they are acting as agents for a CORPORATE REPUBLIC OF SOUTH AFRICA in the interests of foreign corporations and in the interests of the foreign shareholders, which is unconstitutional! Anything unconstitutional is null and void, back to the beginning of the fraud. In the words of Ronnie Kasrils: “Our people were sold down the river.” Our court case will reveal the truth. We are notifying all courts, key government departments, banks, and key agents to cease and desist further commercial claims against the ‘citizens’ as they are living people with already established rights which the Constitution is meant to protect. 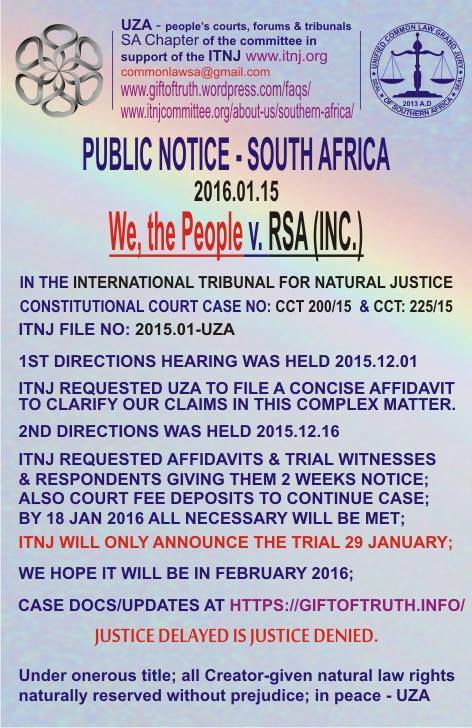 See this page for documents previously filed with the Constitutional Court of South Africa and documents filed with the ITNJ. UZA is taking representative administrative action on behalf of we, the people to re-establish people’s courts on the land where all are equally accountable as peers, and no longer will criminals be able to hide behind corporations or governments. The remedy we are seeking from the ITNJ is restoration of our Peoples Courts, funded by the government of South Africa. From there, our own Peoples Courts will be able to issue a moratorium on foreclosures, conduct investigations into fraudulent banking practices, and hold truth and reconciliation hearings. The people have the fundamental right to participate in their own banks, alternative currency and exchanges, and stockvels, and to develop creative and innovative mechanisms in positive economics; and, the 1994 RDP Policy Framework affirms the development of community banks. There have recently been numerous arrests and seizure of assets of people participating in stockvels. These actions violate the constitution and the natural rights of the people, and must stop. Please support our action; we need to raise ZAR350,000 for this case ($22,890 USD). 1500 brave souls are required to donate ZAR200 (about $12 USD) to our court case expense fund. Please spread the word in the interest and safety of we, the people, the real and only public; freely give and freely you will receive. Please note that all donations are processed via PayPal and this crowdfunding platform works in USD. Contributions in other currencies will be converted to USD by PayPal and will be displayed on this page in USD. Lah and David of Shamanzi visited Baba Credo Mutwa and brought back these messages. Baba sends greetings. He is greatly pleased by what we all are doing. In his old age he has fallen into some feelings of hopelessness, but once again the news about We The People rising more and more, about the international gathering, about the medicine folk gathering to join hands, and our music, brought him hope. brother thomas, Baba is very grateful for all that you and all are doing. Mama Virginia and Baba Credo Mutwa have offered to enter into their ceremonial hut to pray on the day of the trial, so they will join us all in Spirit. 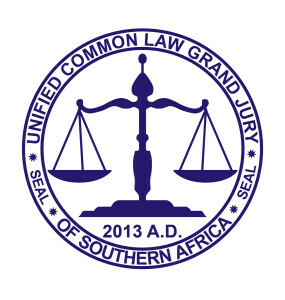 The Unified Common Law Grand Jury of Southern Africa was decreed into session on the 10th Day of November 2013. This is the case of “We, the People” v. our public servants who made a solemn oath to serve and protect we, the people; instead they are acting as agents for a CORPORATE REPUBLIC OF SOUTH AFRICA in the interests of foreign corporations and in the interests of the foreign shareholders, which is un-constitutional! Anything un-constitutional is null and void, back to the beginning of the fraud. In the words of Ronnie Kasrils: “Our people were sold down the river.” Our court case will reveal the truth. Change of date, due to some teething problems; it is after all the very first trial and case before the ITNJ, and the decision was made to push the trial date until all requirements are met, hurdles taken and ducks as neatly and fairly as possible in a row; watch this space, the date could be announced at the end of January, possibly setting it down for end of February; bear with us, we all want this to happen, we are excited and exhausted, we've been onto this for three years now, a week or two won't really make a difference now. thank you for your patience and continued support. Our suggested contribution is $33 USD (about ZAR555), and you can specify any contribution amount higher then $33 USD after you click the Support Now button. All contributors will be acknowledged by name unless you inform us you wish to remain anonymous. All contributors will receive via email a digital download recording of a workshop led by brother thomas (we need your correct email address to deliver your recording). Our suggested contribution is $33 USD (about ZAR555), and you can specify any contribution amount higher then $11 USD after you click the Support Now button. All contributors will be acknowledged by name unless you inform us you wish to remain anonymous. All contributors will receive via email a digital download recording of a workshop led by brother thomas (we need your correct email address to deliver your recording).